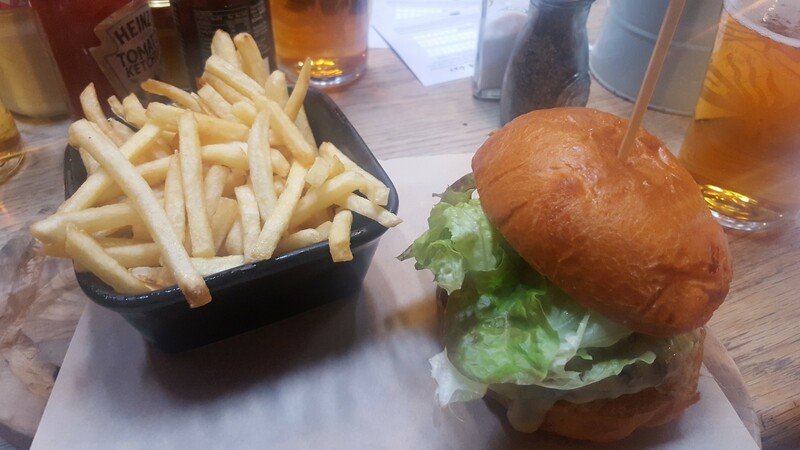 APOLOGIES…that is a burger and chips up there. Not a steak from the restaurant or even a burger from the restaurant. It’s just that one forgot to take any photos and needed something to convince you that this was a restaurant review. If you want to have a burger like the one up there (which was very good by the way) then you need to go to the Crooked Billet pub in Wimbledon. The Hawksmoor website has many more photos if you really need to see pictures of steak. So you are an American in London. You’ve had enough of “traditional fish and chips”, Shepherd’s Pie and warm beer. You’re yearning for a good steak that is going to be reliable, tender and juicy and above all you want a decent damn cocktail! The good news is you need look no further. Hawksmoor is an English take on a traditional upmarket American Steakhouse such as Morton’s, Ruth’s Chris, Smollensky’s etc. You know, dark wood, brass, cocktails to die for and great steak. Well Hawksmoor does all of this to perfection and the one in Air Street, just off Piccadilly Circus has been very successful as a result. Air Street is also very fishy if you don’t want meat. Their fish is sourced from the south coast town of Brixham which has a great reputation for high quality piscine fare. The steaks are not cheap but you get what you pay for. There are a number of Hawksmoor’s dotted around London and they are so chuffed with their product that they now even have opened in New York. The usual suspects had decided to splash out and arrived at 7.30pm to find the restaurant heaving. It’s an imposing, art deco affair on the first floor where stands the cocktail bar. The cocktail bar was staring at us so we ordered cocktails. Sir Cosmo was on a bit of a downer and ordered firstly a Corpse Reviver, followed by a martini made from Deaths’s Door gin. Most depressing. Cocktails are more fun when they have happy or fun names. I always prefer a “slow comfortable screw” or a mudslide. No one is not being deliberately smutty…harrumph! So, food! Yes the steak was good. The crab on toast starter was tasty but one must confess that the toast was somewhat on the tough side and for £12.50, the portion seemed somewhat measly. Maybe they had had a run on the crab and needed to eek it out for the evening. Fortunately, the toast was not too much of a problem as your dear Doctor has a good set of gnashers and managed to get through it. Mains consisted of a few ribeyes, a sirloin for the Doctor and fish pie for Frobisher (trouble with his false teeth.) The chips come in styles. Beef dripping and triple cooked. Both are excellent and and we naturally chose both. We drank a full-bodied, fruity Corbieres which we all thought was rather good. The meal passed without great spectacle, we had a perfect size round table towards the back of the restaurant. The wonderful thing for a restaurant of this size is that we could all hear each other speak. One spotted that the acoustics in this restaurant seem to have been cleverly worked out. Thank you designers! Much better than some of those nauseous places where there are two people in the restaurant when you arrive and it is already impossible to hear eachother. Your doctor has been to Hawksmoor restaurants before. The are always reliable and enjoyable. The staff are well trained, the cocktail waiters actually know how to mix a martini and know all the questions…up, on the rocks, dirty, with an olive or a twist, shaken not stirred, stirred not shaken, premium gin or would you prefer vodka? …Gluten free? Not bloody likely!! Oh yes, and before on departs one ought to let you know that on Mondays (all day), they do a simply spiffing deal where you can bring your own wine which they will open for £5 per bottle. So rummage around in your wine cellars and dust down those Lafitte’s and Mouton Rothschilds and grab a fabulous steak!